Kundalini Yoga classes as taught by Yogi Bhajan are open to all, from beginners to regular practitioners. The teacher will guide you to find your own pace and adapt positions to accommodate or challenge your personal limitations. 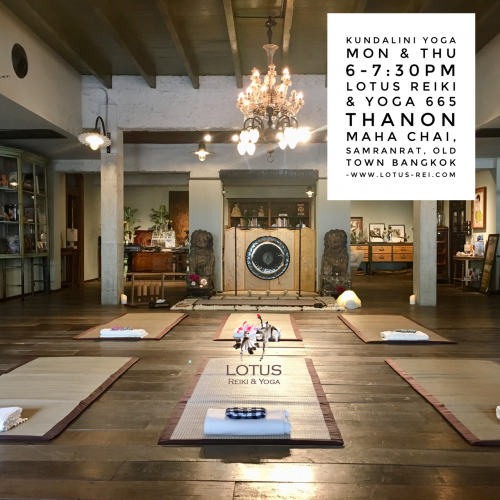 Classes consist of: breathing techniques (pranayam); physical postures (asanas); chanting (mantras); meditation and deep relaxation to the healing sounds of the gong. The potent combination of these exercises serves to tone our muscular-skeletal body, balance our nervous and glandular systems, improve circulation and helps us to master our mind (thoughts and emotions). Please advise the teacher of health conditions before class. Wear comfy clothes to practice in and bring a yoga mat, scarf and drinking water.